I've told you about the contest running over at The Chronicles of Fuji, always fun and thought provoking. The latest in the series of contest questions is "What is the worst conditioned card in your collection and the story behind it." Normally I try to post my answer directly on Fuji's blog, but this one is a little too long to leave there. Growing up in New York, there were lots of kids and lots of them were sports card collectors. Mostly Baseball card collectors, but some, like me, who collected all sports. For us heavy hitters, collecting vintage was a must. And to add an extra layer to that, simply going to a show and purchasing the cards you needed was frowned down upon. Real collectors traded to get their cards. This proved to be a challenge for cards that were not current year.. I had a thing, and still do, for early 70's cards. 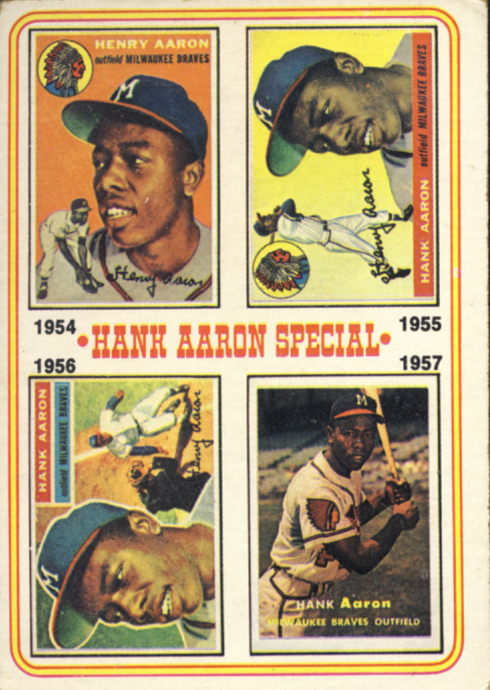 They were slightly vintage and more obtainable through trade than cards from the 60's or earlier. At the time I was working on completing my 1974 Topps Baseball set, a friend and fellow collector was working on the same set. This made things a little competitive as there were not many mutual friends that had cards from '74 to trade. 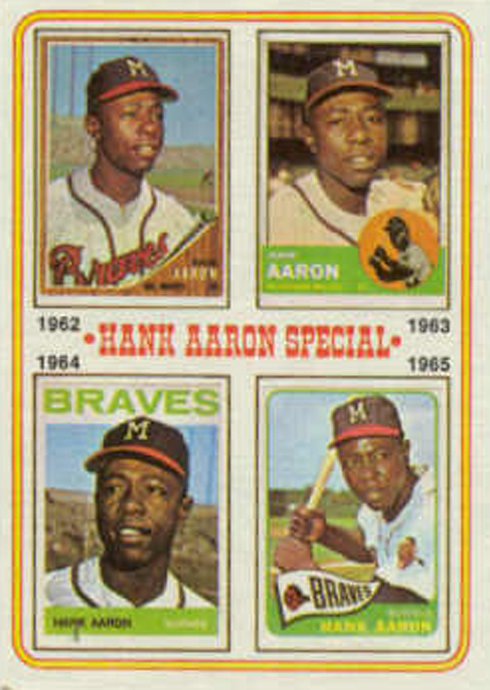 One of the things that differentiated the set was a series of Hank Aaron cards. Aaron had finished the 1973 season with 713 Home Runs, one shy of tying Babe Ruth's record. It was clear that as long as Aaron actually played the next year, he would become the All-Time Home Run King. 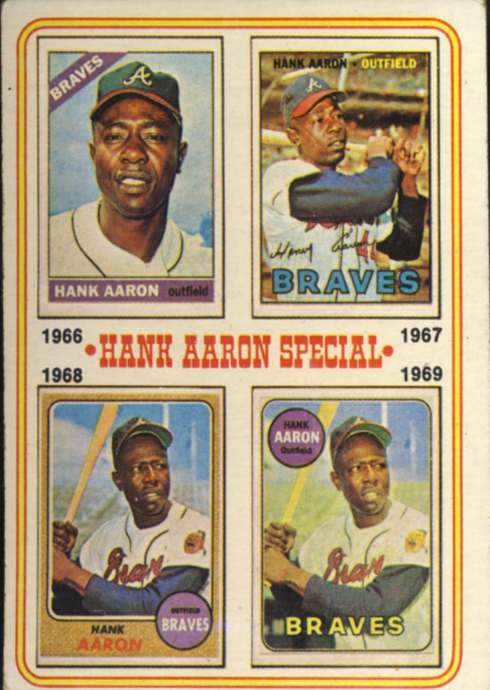 So Topps reserved the first six cards in the set for Aaron. 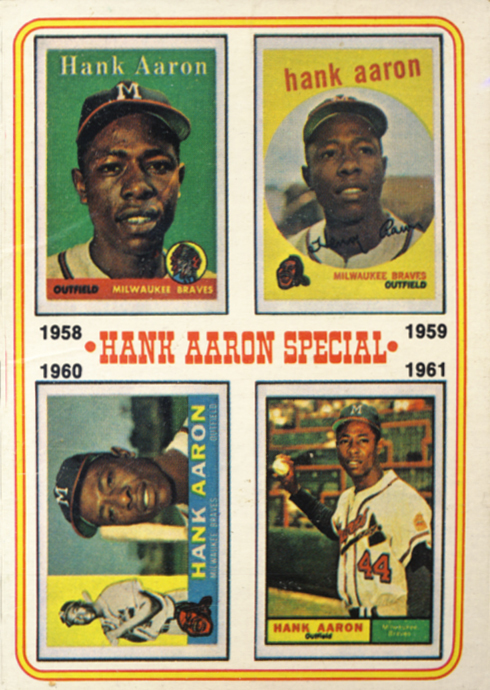 Cards 2 through 6 were given the name Hank Aaron Special and featured a retrospect of all of his cards, 1954 to 1973, along with facts and information about his career on the back. Card number one was reserved for Aaron's actual card for that year, a card that neither myself or my friend had in our collections. One day I had just gotten home from school and ran into an older kid from my building as he was getting out of the elevator . I knew him pretty well because he was the neighborhood stoopball legend and he taught me how to play the game. The guy could do magical things with a Spaldeen. He was struggling, getting off the elevator with several trash bags. I offered to help. As we took the bags out to the street, he told me his family was moving out of the city and his mother was making him toss a bunch of stuff out so they didn't have so many boxes to move. He asked me if I had been playing stoopball and I told him not really. Spalding had stopped making Hi Bounce Pinkys and it had been a while since you could find any at Woolworth's. It wasn't the same game when you played it with a tennis ball. He told me, "that ain't right" and then we made me an offer. If I helped him with the rest of his room, he would give me his Spaldeens. When I got to his room, I noticed a box of battered Spaldeens that were more grey than pink. I started to think maybe this wasn't worth it. When we finished up, he gave me the box of used balls. Then he went into his closet and pulled out two more boxes. The first one was just a shoe box but I instantly recognized the second one. It was a case of pristine, unopened Spaldeens. I asked him if he was sure about this and he said "there ain't no stoops in Jersey." Then he said "you collect Baseball cards, right?" I nodded yes. Then he handed me the shoebox. "There ain't a lot of them, but what I got is good." I thanked him and ran upstairs to start sorting through the cards. Most were current Mets and Yankees, but neither team was playing great baseball at the time. Towards the bottom of the box there were some late 70's Yankees which was good. 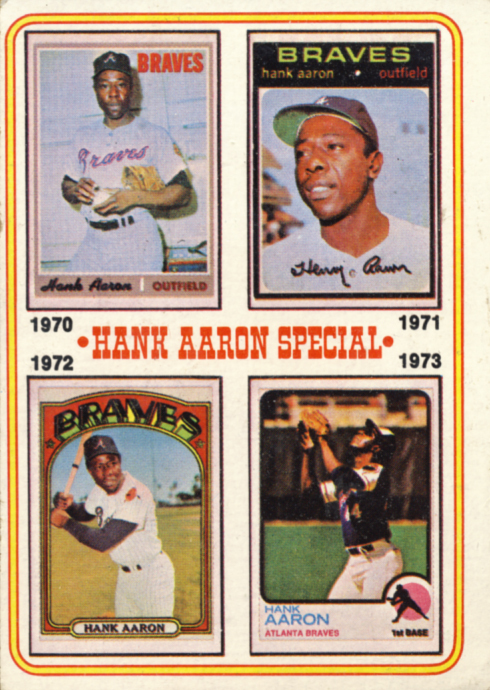 Then just behind a 1976 Oscar Gamble Traded card was a 1974 Hank Aaron, card #1 and it was in really good shape. The next day my friend who was also looking for Aaron #1 came over to my apartment. I showed him the box and the Hank Aaron card. He held it in disbelief and asked me what I had to trade to get it. I told him "nothing, he just gave it to me." Then the most bizarre thing happened. Out of nowhere, he flew into a rage and started crumpling the card like it was an old newspaper. I tried to stop him, but he turned away from me, screaming "he just GAVE it to you?!?" I wrestled him to the ground, but it was too late. The card was destroyed. Still, to this day, I can't fully understand why he did what he did. Needless to say, our friendship was over. So here it is, the worst conditioned card in my collection. I held on to that card, I'm not really sure why. I could have replaced it by now, I'm not really sure why I haven't. Of course, I've outgrown the "must trade rule" and have bought plenty of cards for my collection. 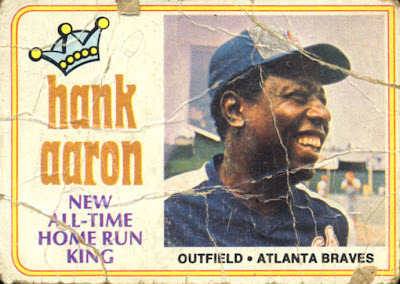 But when it comes to the 1974 Topps Hank Aaron number one I can't seem to just go out and buy one. Perhaps that will change now that I've shared this story. Very cool post. I need & will build this subset and add the #1 card as well. Thanks for sharing... extra credit will be rewarded for the extra effort! Man, what a story. So sad. My heart broke when I read about your buddy crumpling the card, perhaps more for the reason that a friendship was dying in that moment rather than a great card getting destroyed. I'd have knocked him upside the head! I actually have a couple of those Aarons. One in my 1974 set and one in my PC. It is an awesome card. Crazy story! Can't believe he would mess up such an amazing card. Thanks for sharing!